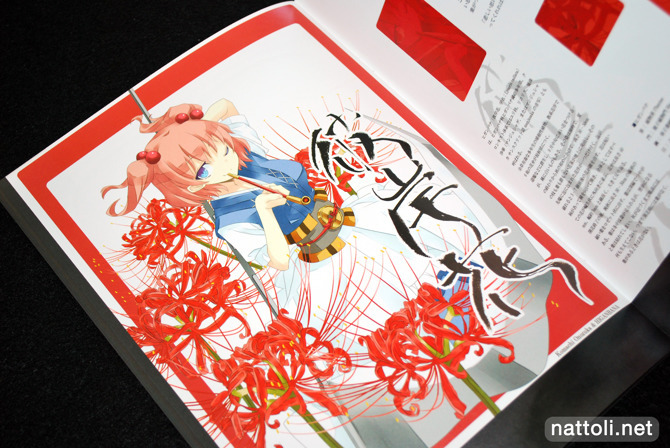 Touhou Souka is a collection of illustrations of Touhou girls pictured with flowers that match their looks and personalities by the circle Lunade Luna. 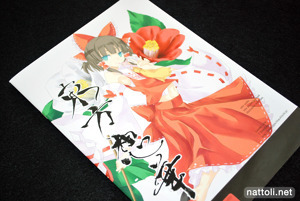 I hadn't purchased anything by the circle before, but I did look up Nabeshima Tetsuhiro's vast array of Touhou art work before hand, so I was pretty clear on what to expect. 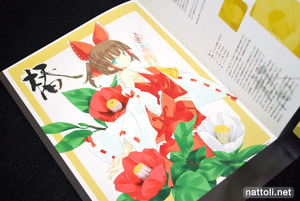 The cover art and the inside art of Reimu Hakurei are actually two different illustrations. 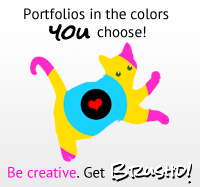 I thought that was promising, when most artists tend to re-use their cover art inside at least once. Touhou Souka reminds me a lot of Aka Ringo's 0 [LOVE] release from Comiket 75. 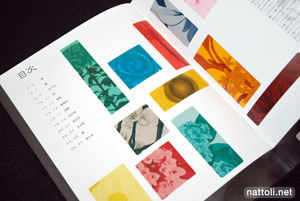 Basically, next to each character portrait page is a breakdown of the elements in the illustration---the flowers and the characters---along with info on each. 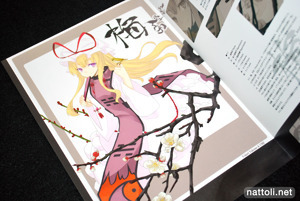 You can see what I mean in the photo above of Yukari Yakumo and the adjacent page. Though I think the character choices are a bit typical for Touhou, I like the style as it reminds me more of Korean artists like Tako Ashin and Nyanya especially in the eyes with the tiny dot pupils in a pool of color. Nabeshima Tetsuhiro also makes the effort to really match (or complement) the girls especially in coloring with their flowers, so it makes for quite a lovely style of portrait. Looking through some of the other works from Lunade Luna, I can see that this isn't the most creative Touhou approach that's been taken by the artist, but it's a lot more polished than his other pieces. The upcoming release for Reitaisai 7 from Nabeshima Tetsuhiro looks like a slightly less finished assortment of Touhou illustrations, but it may still be worth getting, judging by this one.